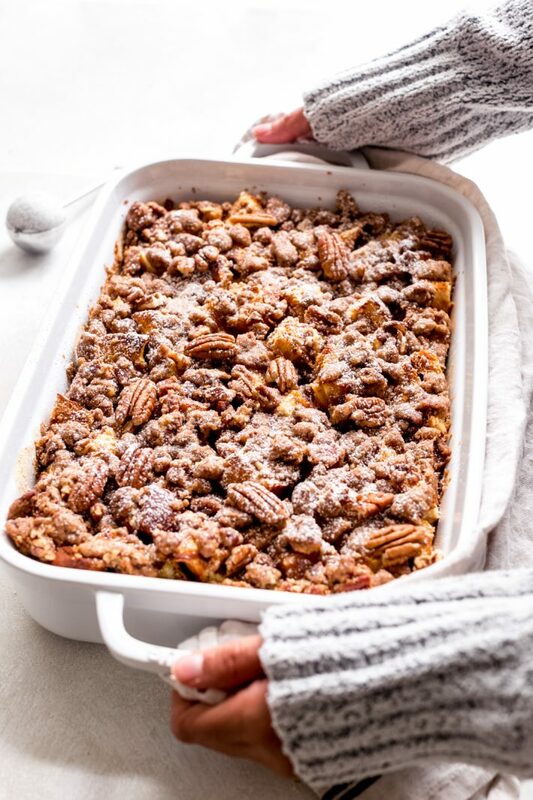 A quick overnight pumpkin french toast casserole recipe that can be assembled ahead of time and baked for breakfast or brunch! Topped with a jumbo lump pecan streusel and just lightly sweet. 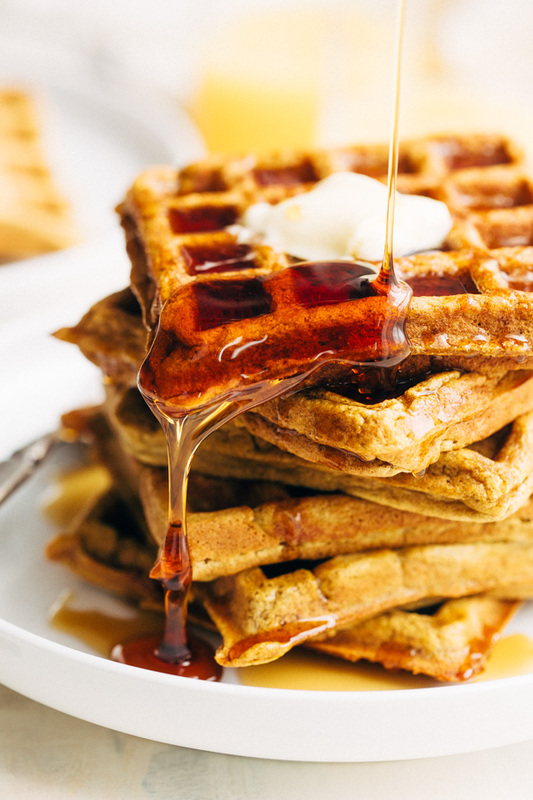 This is going to be your go-to fall breakfast! Hello, my fellow pumpkin french toast lovers! It’s the best time of the year when you can shove pumpkin puree into all your usual weekend breakfast faves. 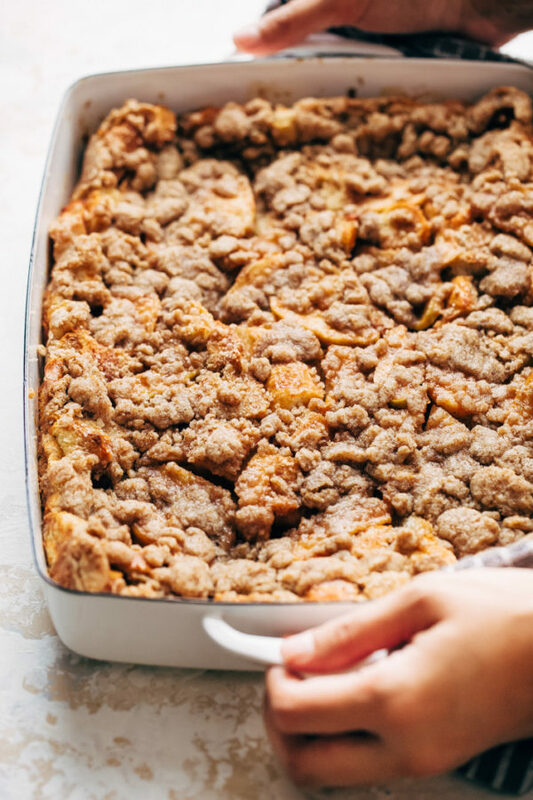 So today, I’m sharing with you my recipe for pumpkin french toast casserole. The best part is that you can make it ahead of time and bake it off fresh in the morning. Don’t you just love overnight french toast recipes? They make entertaining during the holidays or for brunch any time of the year so much easier. I love a good french toast bake. I originally shared this recipe with you guys back in 2015 and decided that it needed a few new pictures and directions that were easier to follow. Don’t worry; I’ve kept the recipe exactly as it is because I feel it’s perfect for our taste buds. Since sharing my pumpkin french toast casserole with you guys, I went on to make a few other french toast bakes. There was the blueberry and cream  one for the summer and an apple pie  one for early fall. And guess what? 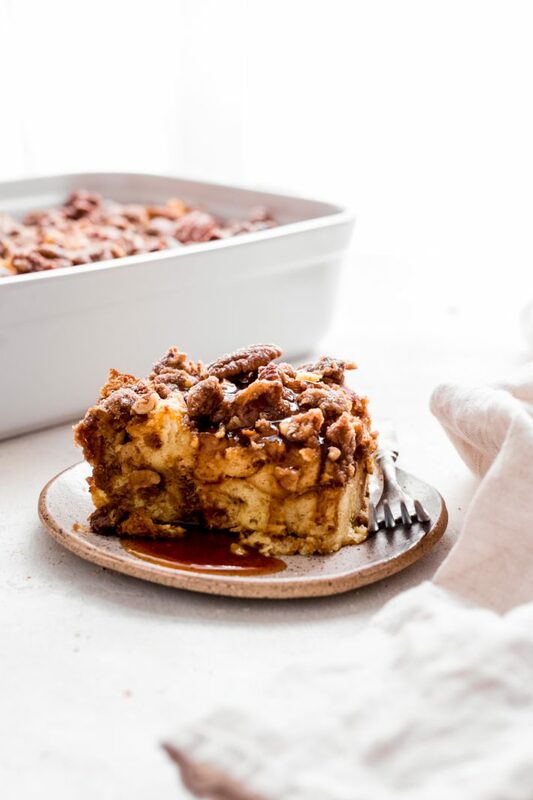 This pumpkin french toast casserole can also be made into individual servings. Just follow the ingredients from this recipe and the instructions from here . Use either streusel recipe, coconut, and almonds of the one with pecans; it’s entirely up to you. 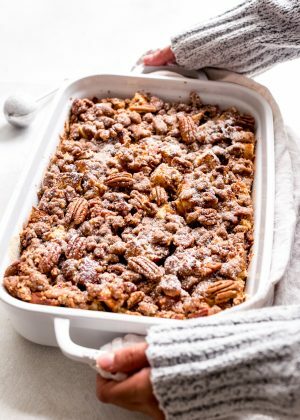 I’m trying this french toast casserole with the coconut almond streusel next time — with the pumpkin spice added in, of course. Because I LIVE for pumpkin spice flavors. I seriously wait for it all year long. 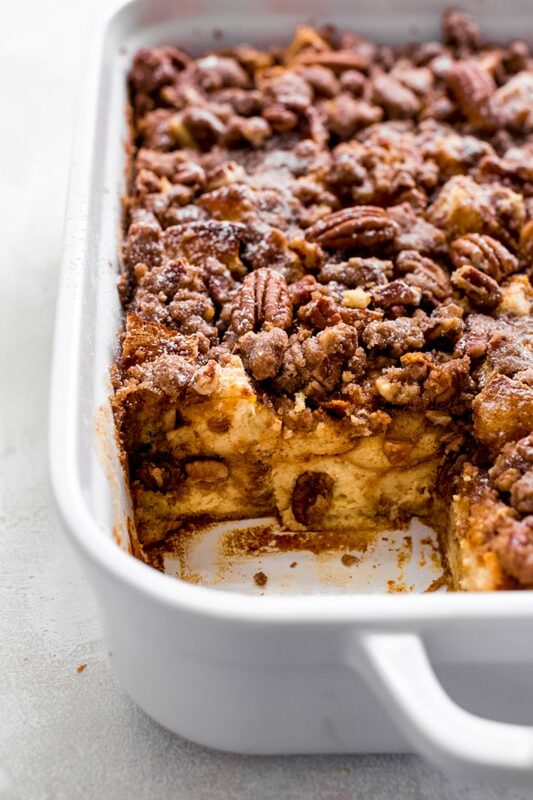 WHAT DO YOU NEED TO MAKE A PUMPKIN FRENCH TOAST CASSEROLE? 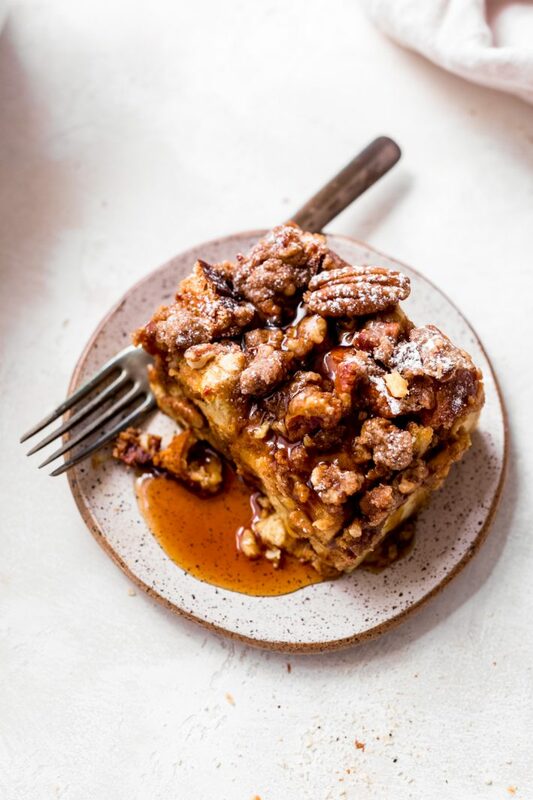 WHAT KIND OF BREAD WORKS BEST FOR A PUMPKIN FRENCH TOAST CASSEROLE? Brioche – usually the best bread for french toast but it’s also a little pricier than the other options because it’s made with tons of eggs and pure butter. 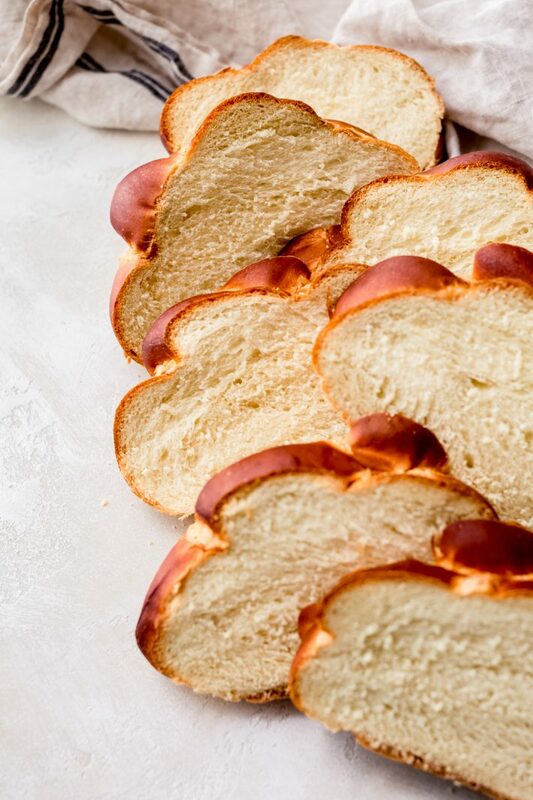 Challah – this type of bread usually doesn’t contain dairy and it super eggy, which make it perfect for things like french toasts or casseroles. 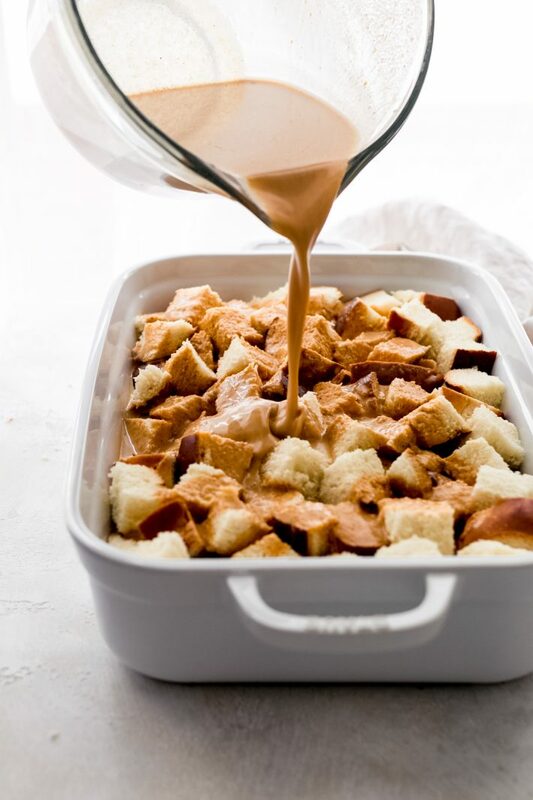 French bread – this kind of bread requires the longest soak, so it’s kinda perfect if you’re prepping overnight french toast casserole. It’s also the most economical option out of three, and it’s what I use when I can’t find good brioche or challah bread. Works like a charm! WHAT IF I DON’T HAVE STALE BREAD, CAN I STILL MAKE THIS PUMPKIN FRENCH TOAST CASSEROLE? Remember, good french toast is always made with day old bread. If you decide to make this casserole last minute and don’t have access to stale bread, here’s a tip. Cube fresh bread, then pop it onto a sheet pan and into a 350ºF oven for roughly 12-18 minutes or until it just barely starts to brown and the bread feels crunchy and hard to the fingertips. Then just let it cool for a few minutes and carry on with the recipe! HOW TO MAKE THE BEST PUMPKIN FRENCH TOAST CASSEROLE. Start by cubing the bread and popping it into a greased 13×9 baking dish  (affiliate link.) Then we’ll make the egg custard portion of our french toast bake. In a bowl whisk together the milk, cream, sugar, eggs, pumpkin puree, pumpkin spice, and vanilla. Slowly pour this into the baking dish and make sure all the bread is evenly soaked. Then let it hang out for at least 3-4 hours and preferably overnight. 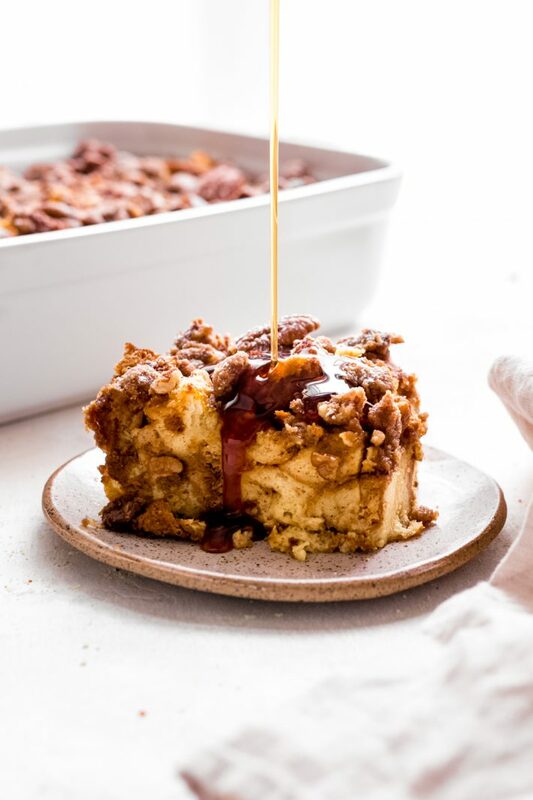 HOW DO YOU MAKE THE STREUSEL TOPPING? 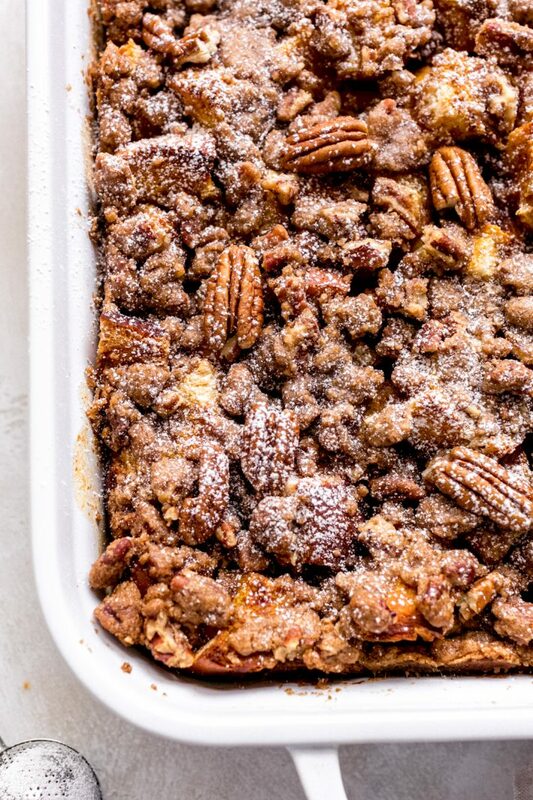 To make the streusel topping we’ll combine the light brown sugar, butter, all-purpose flour, pecans and pumpkin spice in a small bowl. Use your fingertips to help break down the butter into small pieces and let all get coated with the flour and sugar. Just sprinkle this onto the casserole right before baking and then just let it bake in the oven until the custard sets, about 45-55 minutes. Gluten-Free folks, swap the bread for gluten-free bread. Swap the flour for a 1-1 gluten-free flour such as this  (affiliate link) one. You can replace the cows milk with non-dairy milk here. Replace the regular milk with 1 (15-ounce) can of full-fat coconut milk and replace the heavy cream with soy, almond, coconut, pecan, or walnut milk. You can make the streusel portion ahead of time as well and just pop it into a separate container and refrigerate it. Just sprinkle it on the casserole right before baking so that the crumbs don’t mix it with the custard. Test your casserole to make sure it’s done. Insert a wooden skewer into the center of the casserole and if it comes out wet, it still needs a few more minutes of oven time. If your casserole starts browning too much at any point, just use a piece of foil to loosely tent the top. CAN YOU FREEZE ANY LEFTOVER PUMPKIN FRENCH TOAST CASSEROLE? I’m happy to report that yes, you can! We’ve made this quite a few times since I originally published this recipe back in October of 2015 and it freezes beautifully. I usually cut any leftovers into smaller individual portions, pop it into a freezer safe bag or box and then just let it defrost in the refrigerator overnight. It’s the best when you need breakfast to-go but still want something warm and homemade! it requires easy ingredients that you can find at almost every grocery store! everything can be prepped ahead of time and then just baked the day of. Original recipe shared October 2015. Updated November 2018 with new pictures and easier directions. PREP: Spray a 9×13 pan with nonstick cooking spray. Place the diced bread in the baking pan; set aside. In a medium bowl, whisk together the milk, cream, sugar, eggs, pumpkin, vanilla, and pie spice. Pour the prepared custard over the prepared baking pan. Cover with plastic wrap and refrigerate for at least 3-4 hours and preferably overnight. STREUSEL: Combine the light brown sugar, butter, all-purpose flour, pecans, and pumpkin spice in a small bowl. Using your fingertips, mix together until the butter breaks down into smaller pieces. Sprinkle the streusel mixture over the french toast casserole. BAKE: When ready to bake, position a rack in the center of the oven and preheat oven to 350ºF. Sprinkle the prepared streusel mixture over the casserole evenly. Bake the casserole for 48-55 minutes or until the casserole is no longer jiggly. You may need to tent the casserole with a piece of foil if it starts browning too quickly around the 30-40 minute mark, I didn’t. Let cool for several minutes before slicing and serving! Let cool for a few minutes before serving. Serve with maple syrup, butter, and powdered sugar. TO AVOID USING COWS MILK – replace the 2 cups milk with 1(15-ounce) can of full-fat coconut milk and replace the ½ cup heavy cream with ½ cup soy/almond/coconut milk. These can also be baked in individual french toast cups. Use these ingredients and follow the instructions listed here .